Each of the three leading search engines engaged in multi-million pound advertising campaigns over the past 12 months. Yahoo and Microsoft put their money into promotion of their respective search engines, while Google opted to promote its Chrome browser. theEword SEO copywriter Tom Mason examines the effects of each of these marketing campaigns. Tag line: "The internet is under new management. Yours." Theme: The campaign's theme focused on the way browsers could personalise the internet through Yahoo. The strategy – which involved a series of characters featuring on billboards around the UK – portrayed the search engine as a completely customisable experience. "Yahoo took a bold approach in its marketing campaign. The site focused on its core services, such as its mail and messenger service, to promote the ways users could personalise their experiences online." Success: Yahoo grabbed 18.8 per cent of the search market share in September, although this figure declined throughout October (18 per cent) and November (17.5 per cent). Theme: Search is too confusing, or at least, that's what Bing would have us believe. In a series of online, print and radio adverts, the campaign for the launch of Bing focused on the simplicity of the search experience. "Bing tries to convince the user that it offers a simpler way of searching the internet. The campaign quickly establishes itself as 'not Google', a marketing strategy which portrays Bing as an easier search experience." Success: Bing experienced a steady increase in search share beyond its initial advertising period. Despite fears of a drop in users after the campaign finished, its share grew from 8 per cent of the market in May to 10.3 per cent in November. Theme: Google took its first steps into the advertising world with a billboard and national newspaper campaign for its internet browser. The approach highlighted the apparent reliability of the service. "Google typically shies away from offline advertising, so to see this marketing campaign came as a surprise to many in the SEO community. The Chrome marketing strategy is quite clever, highlighting not only the reliability of the browser, but its universal appeal." 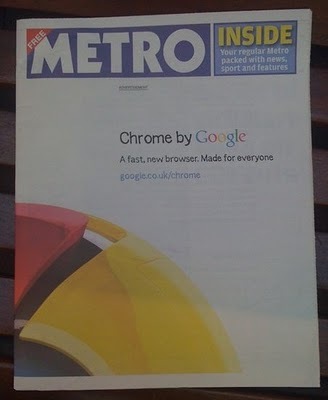 Success: Google Chrome clocked up a 4.63 per cent of the market. This is compared to the 3.93 per cent it registered in November.